Kamchatka Peninsula in the far east o Roushie. 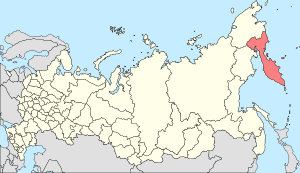 The pink aurie is the Kamchatka Krai which includes some o the mainland tae the north. The Kamchatka Peninsula (Roushie: полуо́стров Камча́тка, Poluostrov Kamchatka) is a 1,250-kilometre-lang (780 mi) peninsula in the Roushie Far East, wi an aurie o aboot 270,000 km2 (100,000 sq mi). This page wis last eeditit on 7 Mairch 2016, at 20:53.